Sotheby’s will auction a Ref. 3646 / Type B with “Radiomir Panerai” sandwich dial, Rolex Cal. 618 / Type 1 movement and engraved caseback (lot 946) in their New York auction Important Watches on 6 December 2017. 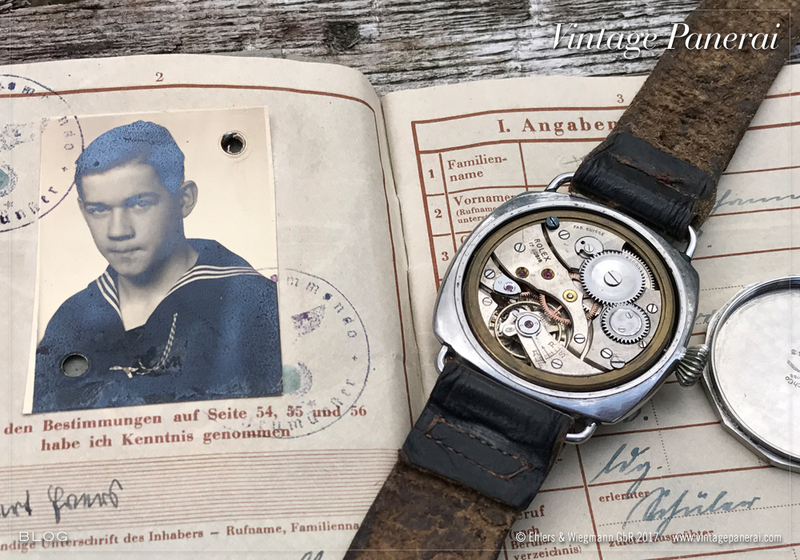 Read more about the history behind this 3646, which carries you back to the last days of the Second World War at the river Elbe, here in our watch point. Sotheby’s will auction a Ref. 3646 / Type B “Radiomir Panerai” with engraved caseback in their New York auction Important Watches on 6 December 2017. 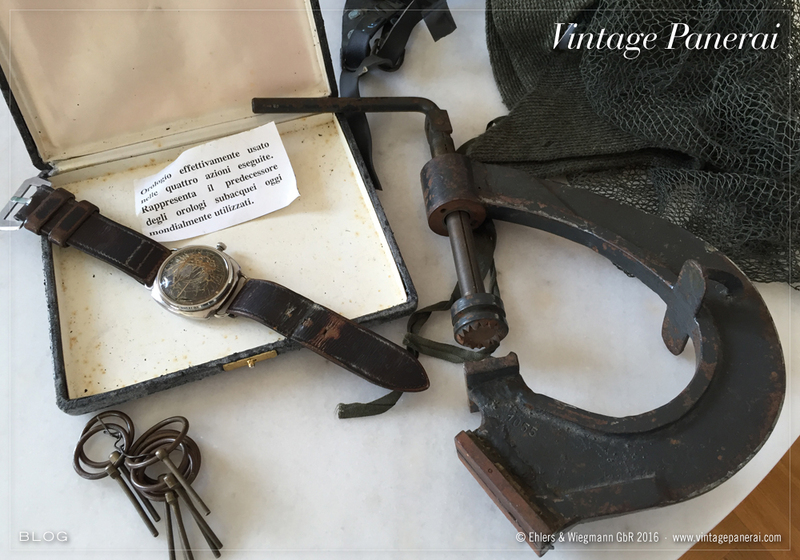 The watch (lot 946) has been recorded in our database in 2016, along with information which we have received from the descendants of a British Army veteran who brought this watch back home as a souvenir from the Second World War. Featuring the small Oyster Watch Co hallmark on its inner caseback, an onion shaped “Brevet +” crown (Type 11) and Rolex Cal. 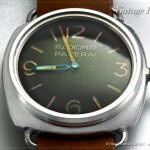 618 / Type 1 movement, the watch with a “Radiomir Panerai” sandwich dial stands in our database as another surfaced Ref. 3646 / Type B with an engraved caseback, providing a very interesting story in terms of how these watches changed ownership at the end of the war. 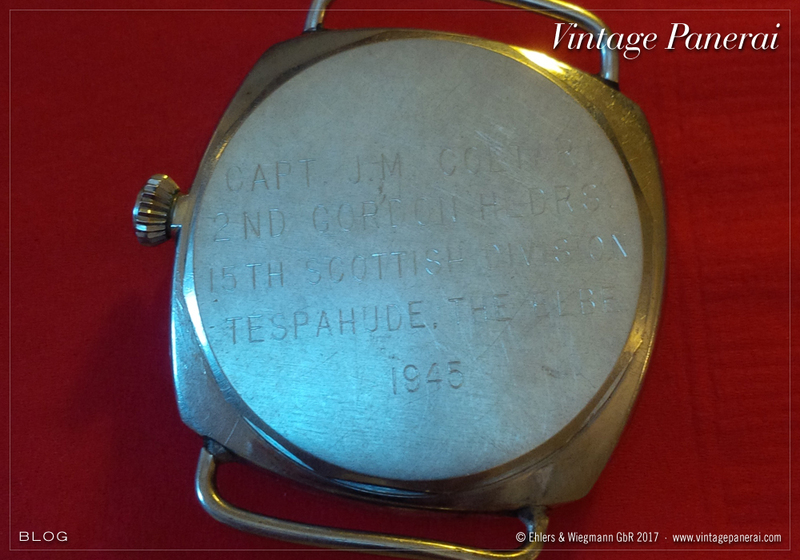 The history behind the engraving on the caseback of the watch in auction at Sotheby’s has been provided to us by the family of Captain Coltart. 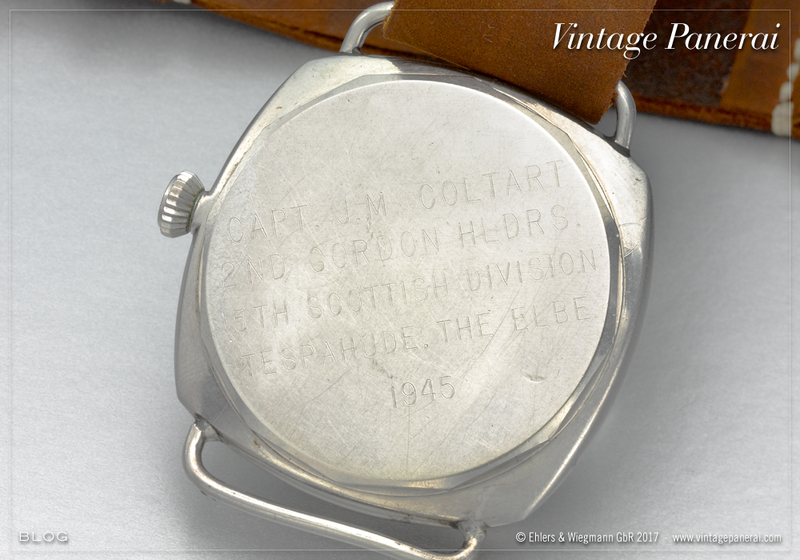 Here is a little information on the watch since it came into the Coltart’s possession in 1945: Captain John Maxted Coltart, initially a member of the Black Watch Regiment (RHR) was transferred to the Gordon Highlanders of the 15th Scottish Regiment for the balance of the war. 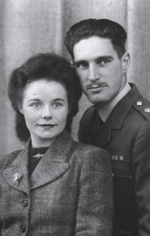 After his marriage on March 17, 1945 he returned to duty in Germany to do his part in the crossing of the Elbe. 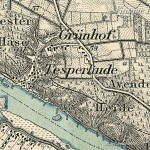 He had tales of the struggle to build and maintain the bridge across the Elbe between Tespe on the South shore and the bridgehead at Tesperhude on the North bank. The bridge was under continuing assault by artillery fire, swimmers in the water and terrifyingly fast jet planes which had just entered the war. Captain Coltart brought a number of war souvenirs back to Scotland, including a Luger pistol, the Panerai divers watch and a dagger. He brought them to Canada when he and his family immigrated in 1955. His daughter inherited the watch upon his death in 1984. 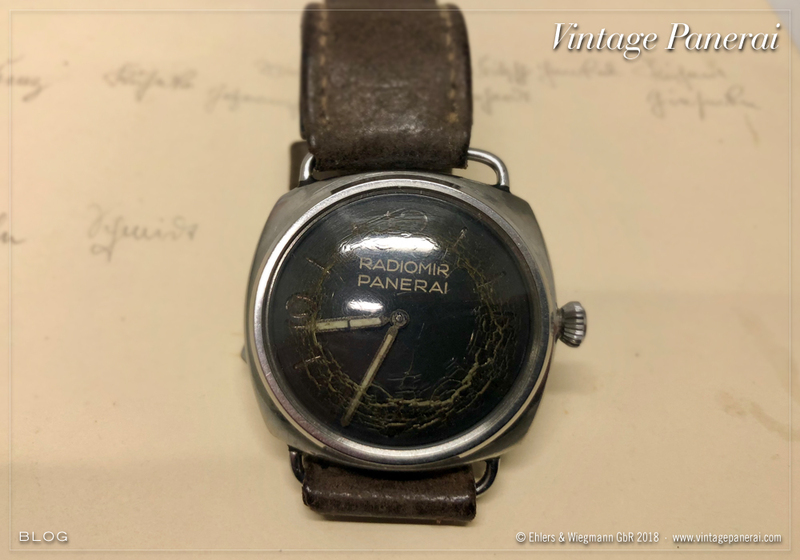 She had no idea the watch had value other than a keepsake until a Scottish cousin with a good memory emailed a clipping describing the sale of a similar Panerai watch. 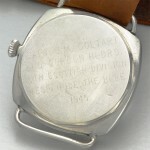 Captain Coltart had the back of the watch engraved to commemorate the last battle he took part in and the location where he obtained the watch. 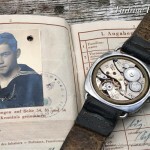 At this point it is unclear exactly how he managed to collect these mementos but it is clear that they were obtained while on active duty in Germany during the Second World War and have been in the family ever since. The particular distinction for the 15th Scottish was to be selected to lead the last set piece river crossing of the war, the assault across the River Elbe (“Operation Enterprise”) on 29 April 1945 spearheaded by the 1st Commando Brigade (commanded by Brigadier Derek Mills-Roberts), after which they fought on to the Baltic occupying both Lübeck and Kiel. The 15th (Scottish) was the only division of the British Army during the Second World War to be involved in three of the six major European river assault crossings; the Seine, the Rhine and the Elbe. 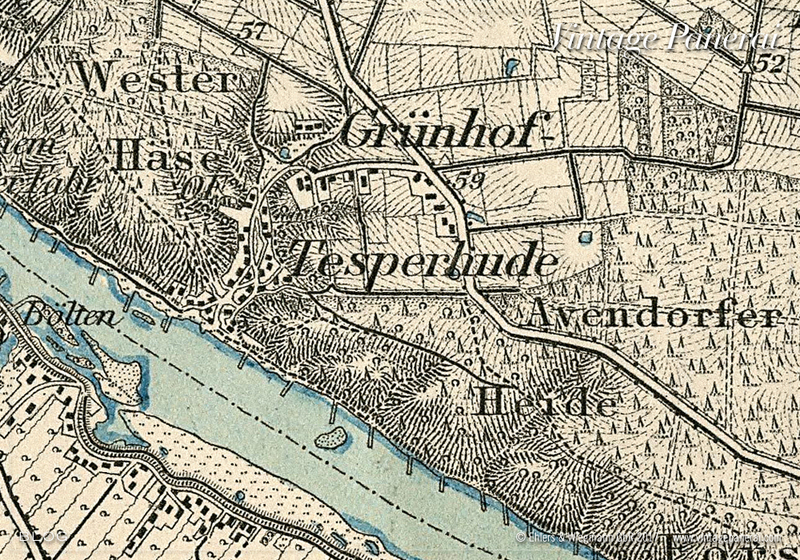 The crossing of the river Elbe at Lauenburg has been part of our research for our book “History2”, chapter IX (page 825-845 with historic maps and photos taken during “Operation Enterprise” in the river Elbe area at Tespe – Artlenburg – Lauenburg) in which a surviving frogmen particularly mentioned the railway bridge of Lauenburg (see photo above, page 824-825) being one of their mission targets in the last days of the Second World War (19 April 1945), followed by the attemp to destroy the 946 ft. “Class 40 Bailey Pontoon Bridge” at Artlenburg (west of Lauenburg, 28/29 April 1945) by a group of German frogmen (see photos on page 842 and 843). Photo left: view onto the Rolex Cal. 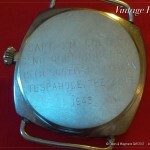 618 / Type 1 movement of the watch in auction. Similar watches of the Ref. 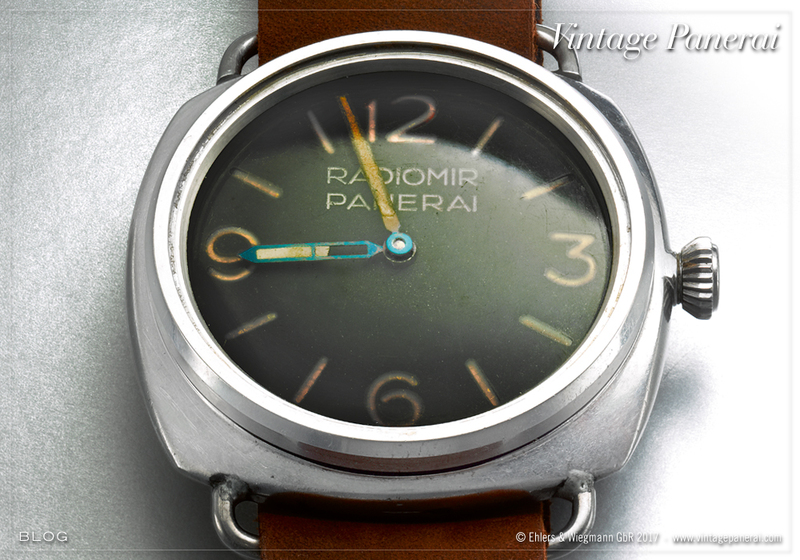 3646 / Type B with “Radiomir Panerai” sandwich dials have been published earlier here and here. A special thanks to the descendants of Captain Coltart who provided us information on the Ref. 3646 / Type B and its story behind. 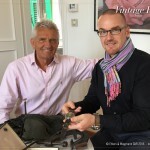 We hope that this watch will find a good new home and remains surfaced in the Vintage Panerai collectors world. Another Ref. 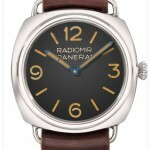 3646 / Type B watch with “Radiomir Panerai” sandwich dial has been added into our database. 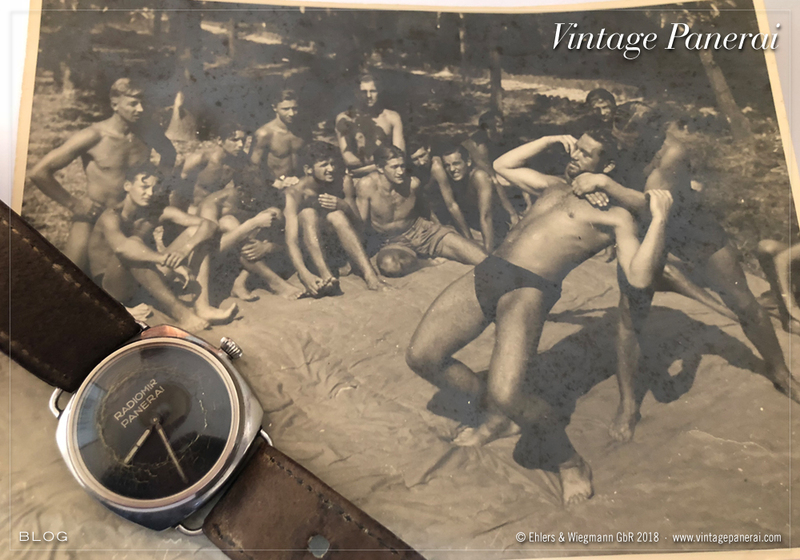 The actual owner of the watch provided us further information on the first owner with the very rare ID of the german frogman Robert E., dating back to the last months of the Second World War. The watch appears with its original leather strap and nickel-plated brass pin buckle. 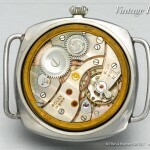 The inner caseback bears the typical Rolex hallmark, case and reference number, known in watches of the Ref. 3646 / Type B as well as the Rolex Cal. 618 / Type 1 movement. The initial Rolex screw-down crown has been replaced with the crown mounted on the watch, shown in the actual photos. At the age of 17, Robert E. posted to the Kommando der Kleinkampfverbände in February 1945. 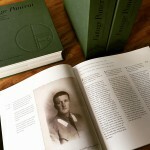 He took part at a special training course for frogmen and divers, held at a small Danish Island (see page 203 of our book “History1”) documented in his ID by the stamp “Kampfschwimmer- und Tauchlehrgang”. 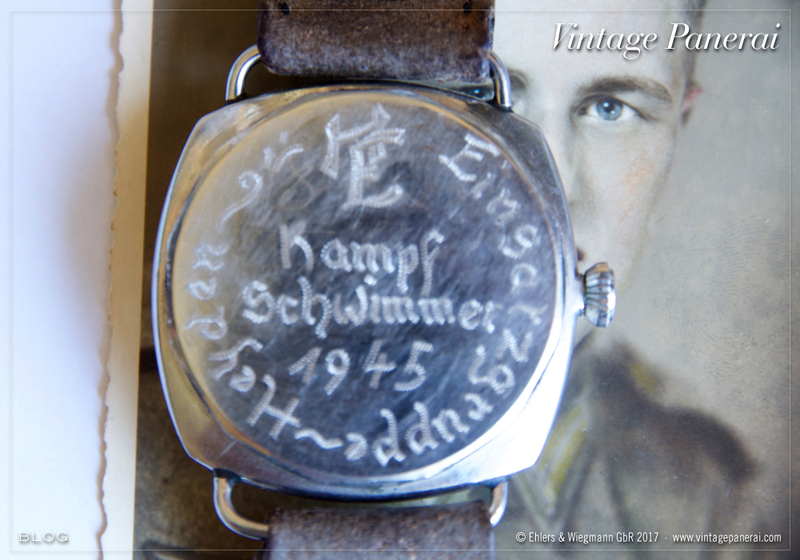 Another signature in his ID is showing a stamp of the Kampfschwimmergruppe Ost (eastern combat swimmer group), to which he was posted after the training, dating back to April 1945. 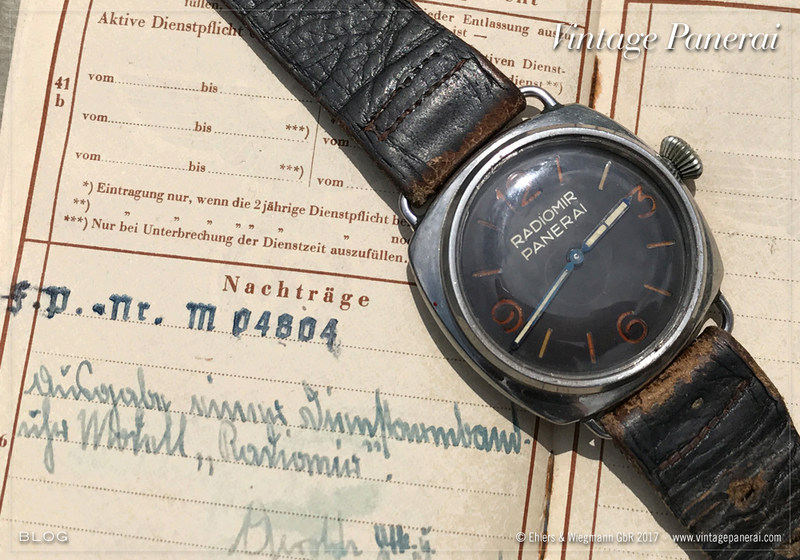 A very interesting supplementary note can be found in his ID, hand written below the field post number: Ausgabe einer Dienstarmbanduhr Modell “Radiomir” confirming that a diving watch was issued to him for duty, even more mentioning the particular model being a “Radiomir”. Rare documentation, such as an ID of a frogman, providing interesting information about which ways these watches took many years ago. 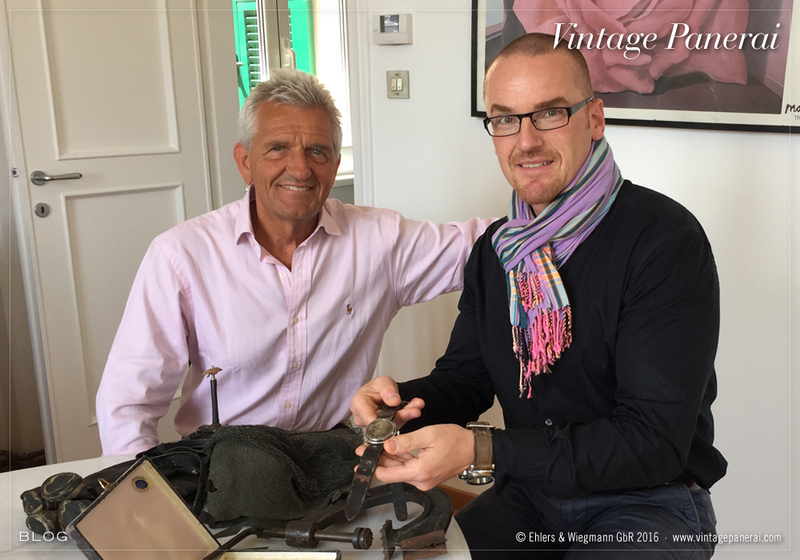 Thanks to the owner for providing the additional info aside the details of the watch, being a new entry in our Vintage Panerai database! You never know how long it takes until a “new”, yet unknown watch surface after many years. This happened quickly twice in the last weeks, with another addition into our database in shape of a Ref. 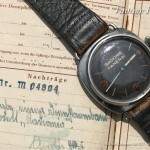 3646 / Type B with “Radiomir Panerai” sandwich dial and completely engraved “Kampfschwimmer” caseback. Different to the Ref. 3646 / Type C with riveted plastic dial introduced earlier here (which included a month-lasting research for the family of the frogman), this rare Ref. 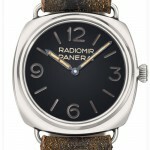 3646 / Type B “Radiomir Panerai” watch was introduced to us by the grandson of the frogman. Complete with the original strap and nickel-plated brass buckle, the watch with the small Oyster Watch Co hallmark on its inner caseback appears after 72 years with the original domed plexiglas, onion shaped “Brevet +” crown (Type 11) and Rolex Cal. 618 / Type 1 movement. 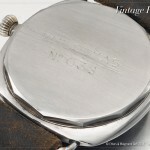 The caseback of the watch bears the initials “HE” of the first owner. 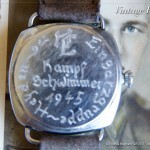 The frogman belonged to the “Einsatzgruppe Heyden” which is engraved around the word “Kampfschwimmer” and the year of service, 1945. Lieutenant-Commander Günter Heyden was a founding member of the newly formed German commando frogmen (Kommando Spezialkräfte Marine) in the 1950’s. 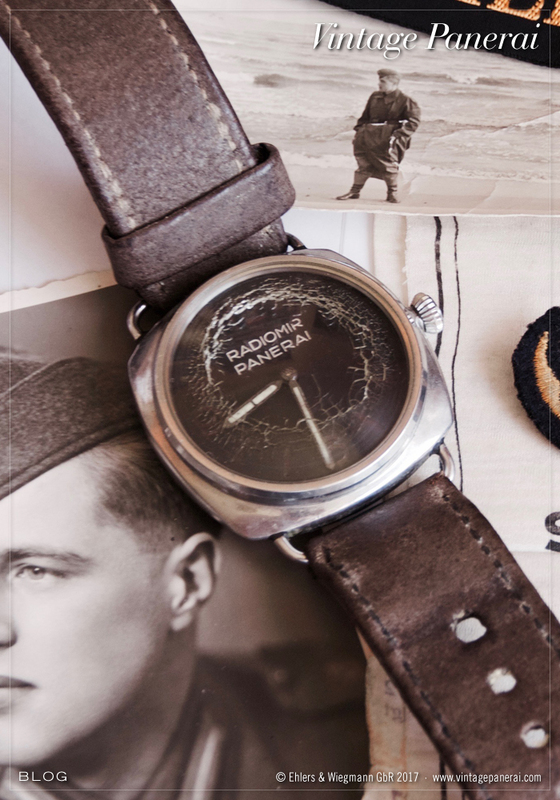 The watch is accompanied with historic photos of the veteran as well as a very rare pay book (silmiar to only two others known which are made of the same material, see page 138 in our book “History1”) and which was issued to the members of the “Lehrkommando 700″ in the last months of the Second World War. Not enough rarity, there is a swordfish probation insignia (see page 802-804 in our book “History2”) and a nose clip which was used by the frogmen during the use of a small breathing apparatus (without face mask, see page 671 of our book “The References” 1930’s-1940’s and page 718 of our book “History2”). Watches of the Ref. 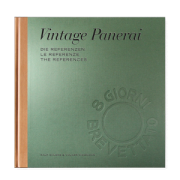 3646 / Type B are featured in our book “The References” (first volume / 1930’s-1940’s) in chapter II.II on page 170-247. Christie’s features two Ref. 3646 watches in their upcoming auction on 14 November 2016 in Geneva (Sale 1417). The first Vintage Panerai watch in Christie’s Sale 1417 is a Ref. 3646 / Type B with dark red aged “Radiomir Panerai” sandwich dial and Rolex Cal. 618 / Type 1 movement. The watch is recorded in our database since 2010, back then with a cylindrical “Oyster Patent +” crown (Type 13). The onion shaped crown which is acutally fitted to the watch appears to be a replacement for the earlier cylindrical shaped crown during the last years (after March 2011). 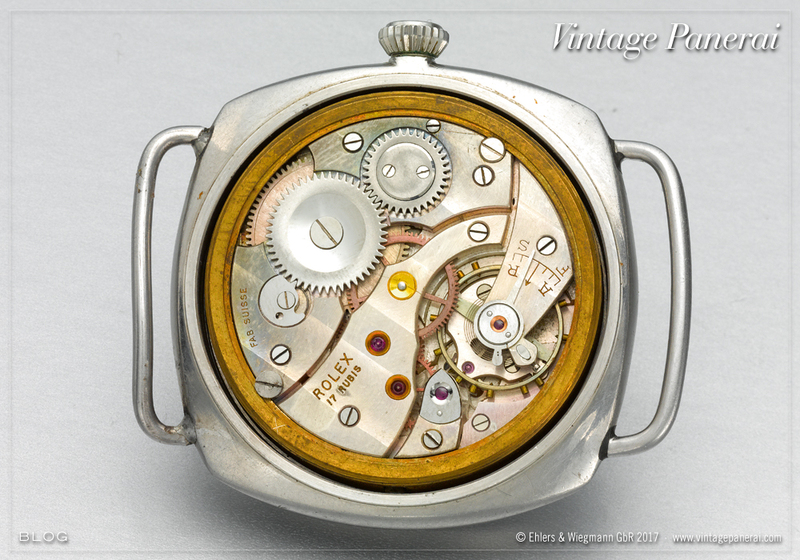 The inner caseback bears the small Oyster Watch Co hallmark, which is a typical feature of Ref. 3646 / Type B watches. The outer caseback shows the remaining engravings of a rare matriculation number of the Italian Decima Flottiglia MAS (short “Xa FLOTMAS No. 038”). Information about Ref. 3646 watches with a “Xa FLOTMAS” engraving on their casebacks can be found on page 301-303 in chapter II.III. 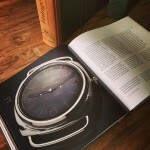 Further info on this watch (lot 99 / page 69) can be found here. The second Vintage Panerai watch in Christie’s Sale 1417 is a Ref. 3646 / Type C with “Radiomir Panerai” sandwich dial and Rolex Cal. 618 / Type 1 movement. 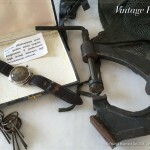 The watch is recorded in our database since 2011, back then with “double pencil” shaped brass hands, which have been replaced with blued steel hands in March 2013 on demand of the former owner. 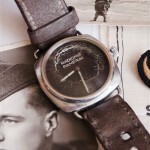 The watch was listed for sale at Chrono24 earlier this year. Watches of the Ref. 3646 / Type C are featured in our book “The References” (first volume / 1930’s-1940’s) in chapter II.III (page 248-397). 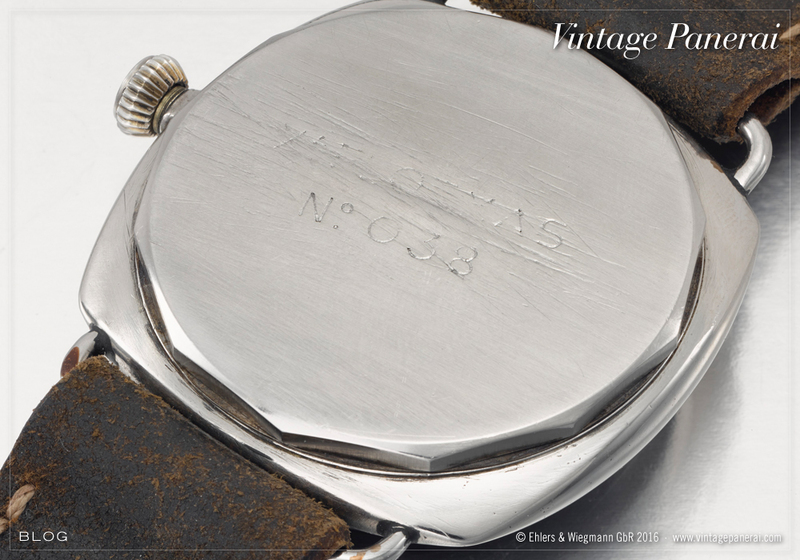 Further info on this watch (lot 209 / page 145) can be found here. Always a special moment, which does not happen very often: Meeting a family member of a veteran who used a Panerai watch in duty many years ago. Not that its already something special to let such a meeting become real. 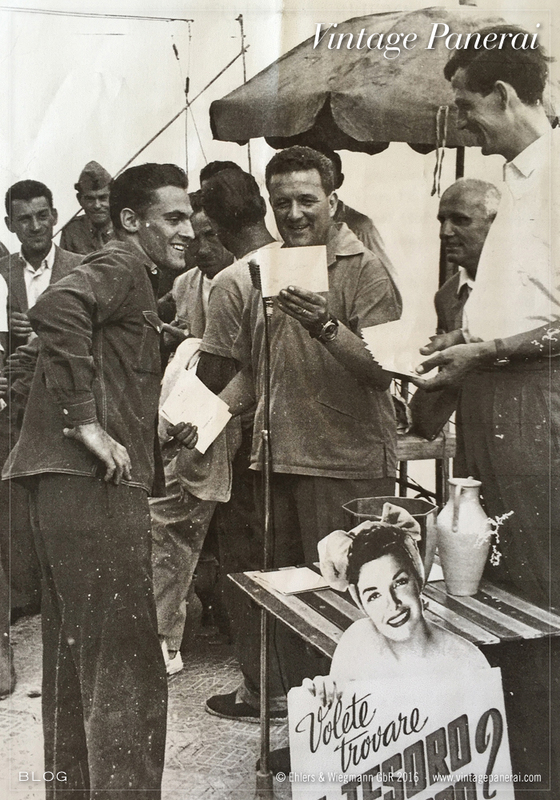 But when its about one of the most famous Italian frogmen of the Second World War, its getting an even more special occasion to look forward with great excitement. So, finally – it happened. After being connected with Paolo Ferraro, son of Luigi Ferraro M.O.V.M. 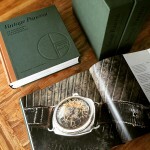 since a few years when we had the idea to put a spotlight onto the Vintage Panerai Ref. 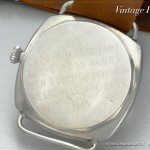 3646 / Type B watch, which was on Luigi Ferraro’s wrist during the four “Stella” missions in the eastern Mediterranean back in the summer of 1943 – almost 73 years ago. Not sure about the reaction of the family towards us when we made the initial contact back some years ago… some yet unknown strangers from the internet asking for info on their father’s watch may sound strange… go figure. 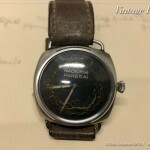 But very soon it started to become a very nice conversation, answers to questions, interesting informations and the feeling to be recognized for the attemp to not only publish photos and details about their father’s watch, but also to remember the person behind it – a family affair. One day it was the moment to finally meet Paolo Ferraro in person, and “by the way” (it always turns out great when these words are used) being able to look not only at the watch but also more interesting memorable things which the family kept since their father passed away in 2006 – the ultimate way to “get in touch” with these fantastic timepieces with a real history behind. Opening an old grey box, carefully, looking at the watch which clearly shows its age and use in decades – holding a piece of Panerai history for an exciting moment to remember. The table became soon loaded with more. More historic relicts, which were kept together since many years (and hopefully many more): the woolen cap with web to cover his face. A float to carry mines for miles on his way thru the night to reach his targets. The heavy steel clamp to fix the charges on the bilge keel of an enemy ship. And last but not least even the fuses, which found their way back on land – two from each “Stella” mission, making it a bundle of eight in total. Allora – all on that table – equipment used by Luigi Ferraro, a member of the “Gruppo Gamma”. Here and now. At a corner of the table an old photo found my attention, a photo that I did not remember from any books I gathered in my library about Luigi Ferraro in years before. Easy to identify him in the center, holding a note in front of a microphone for giving a speech, joking with a friend on the left. Paolo pointed on the tall man on the right “and the gentlemen standing next to my father is Jacques Piccard, the famous deep sea explorer”. Both clearly sported watches on their left wrists. Not very sure about Piccard’s, but even more sure about the watch on Ferraro’s wrist: the same watch which was resting on the table I was sitting in front of, holding that photo from the 1950’s …made my day. We would like to express our sincere words of thanks to Paolo Ferraro for making his father’s watch accessible for our records and to become a part in our new book. Not that this would have been more than we expected, he even connected us with another famous watch. 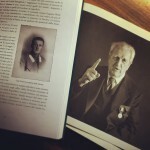 Read more about how how the watch and the story of Luigi Ferraro M.O.V.M. found their place in chapter II.II of our book “The References” 1930’s-1940’s here. A “Gamma” frogman who wrote history. A photo from 1998 which was a reminder not to miss the chance to capture Luigi Ferraro’s story in our book “The References” – together with the 3646 / Type B watch he was wearing during the “Operazione Stella” in 1943. One of the few watches which can be followed back to the first owner, which is also a very famous one: Luigi Ferraro (M.O.V.M.). Not easy to capture as much as possible of his story in a part in the first volume of “The References”, which filled several books of Italian authors with hundreds of pages. Even in the first Panerai books, written by Giampiero Negretti in 1998, Luigi Ferraro’s famous missions in the mediterranean sea found their place to be mentioned. To get in touch with the family of the veteran Luigi Ferraro (1914-2006) was a very intensive and exciting time during the research about his Ref. 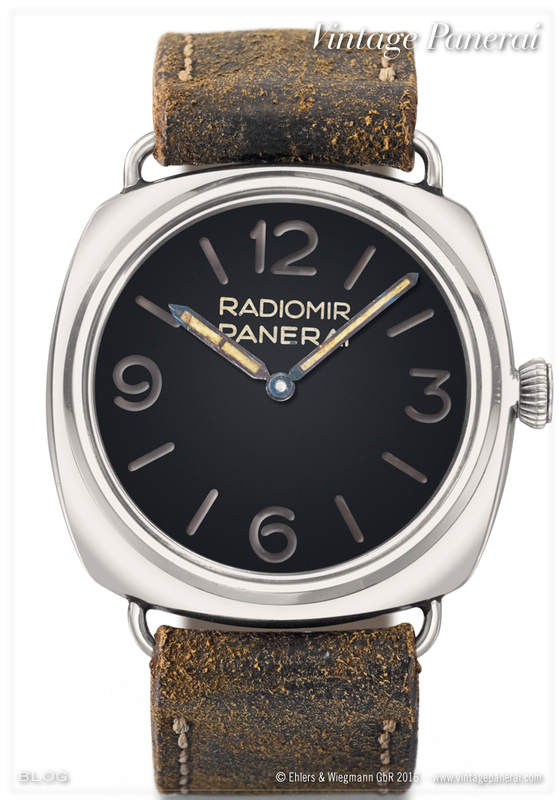 3646 / Type B “Radiomir Panerai” with riveted plastic dial (chapter II.II page 190-203). Paolo Ferraro, one of Luigi Ferraro sons, provided excellent photos and made personal documents available for us to be featured in our book, which gave us the chance to illustrate the history behind his father’s watch. In January 1943 Luigi Ferraro obtained his qualification to carry out underwater missions. 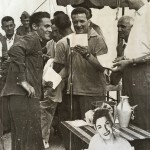 Initially posted to North Africa to attack enemy targets in the Port of Tripoli, he had to leave the area and returned to Italy. In May 1943 he was posted to La Spezia, where he received instructions from commander Borghese for a new mission – this time not in North Africa, but in the eastern Mediterranean: the Turkish ports of Alexandretta and Mersina. Luigi Ferraro’s four “Stella” missions, for which he was awarded with the M.O.V.M., are described in chapter II.II (page 204-225). Aside several tools of his time as a “Gamma” frogman, Luigi Ferraro’s 3646 / Type B “Radiomir Panerai” never changed ownership and remained a memorable piece for him and his family since he returned from war. The watch shows intensive proof of aging and is an example of how different these rare watches have aged after more than 70 years. The watch still has its original strap, as well as its original domed plexiglas crystal – intensively aged with countless fissures. 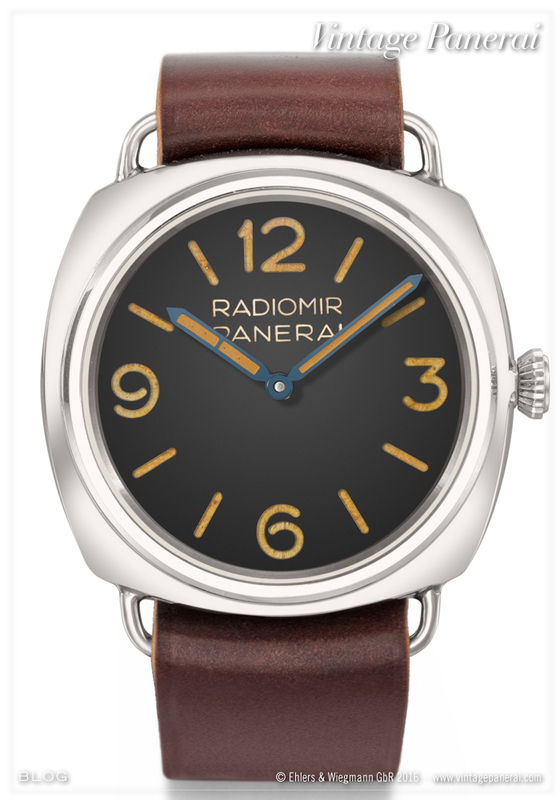 Numbers, indices and the typical “Radiomir Panerai” lettering on the riveted plastic dial can still be made out at some points. Luigi Ferraro’s watch has been recorded in our database in 2014, however the watch was known to us already years before. The Rolex 618 / Type 1 movement in combination with the small Oyster Watch Co hallmark, embossed on the inner caseback together with the reference and case number, is matching our criteria for being a watch of the Reference 3646 / Type B. The outer caseback bears a rare matriculation number, of which only a very few 3646 watches are known today. We have published further information about the different matriculation numbers on some of these watches in chapter II.III (page 301-303). 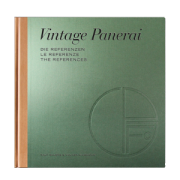 Luigi Ferraro’s 3646 / Type B “Radiomir Panerai” with riveted plastic dial is published extensively in chapter II.II (page 190-203) of the book “The References” 1930’s-1940’s. 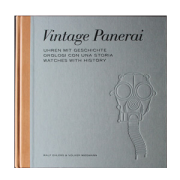 More 3646 watches with an interesting history, related to their first owners and the missions they carried out during the Second World War, are introduced in chapter II.I (Ernesto Notari) and in chapter II.III (Licio Visintini). Enjoy reading! Only less than a dozen Reference 3646 watches with a riveted plastic dials were recorded in our database until our new book “The References” was published. Among the more than 200 recorded watches of the Reference 3646 in total, this dial version can be called one of the rarest. Read in the first volume (1930’s-1940’s) of “The References”, in which of the seven different number groups (3646 / Type A to 3646/ Type G) we have recorded watches with this version of the famous “Radiomir Panerai” dial from Guido Panerai & Figlio. The coffee table shot shows one of these few watches with riveted plastic dial, a Ref. 3646 / Type B, documented in chapter II.II on page 176-189.